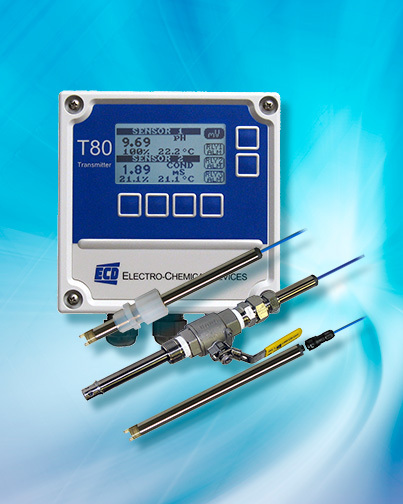 The T80 Universal Transmitter from Electro-Chemical Devices Inc is now available with dual channel functionality, allowing process technicians to measure two of any seven popular liquid process parameters simultaneously with a single transmitter, eliminating the need to buy multiple transmitters and reducing the cost of process measurement. The T80 Universal Transmitter features a highly intelligent digital transmitter protocol to simplify process measurement and reduce maintenance costs for seven common industrial plant parameters. Process measurement has never been easier or more affordable than with the T80’s virtually plug-and-play capabilities, which simplify daily operations and maintenance while reducing instrumentation costs simultaneously. The ECD Model T80 Universal Transmitter is now available in a dual channel configuration. It designed for the continuous, simultaneous measurement of up to two parameters in a general-purpose industrial environment: pH, ORP, pION, Dissolved Oxygen, Turbidity, Conductivity or Resistivity. The Model T80 digitally communicates with any ECD Model S80 Intelligent Sensor and automatically conﬁgures the transmitter’s menus and display screens to the measured parameter. The Model T80 automatically configures to any of the listed measurements so that there is no longer any need to inventory multiple instrument types, saving time and reducing plant operating costs. Flexible and user-friendly, the T80 Universal Transmitter offers membrane switch navigation, a simple menu structure and soft key menu choices and an easy-to-read 2 ¾ -x- 1 ½ inch LCD display. The T80 accepts any S80 intelligent sensor or any standard pH sensor with solution ground using the optional T80 input card as an input. It is available with 4-20mA output with MODBUS RTU on 24VDC and 110/220VAC instruments. The T80 can be configured with optional HART 7 communication and an optional three alarm relay. The Model T80 transmitter features digital communication with any Model S80 Intelligent Sensor, automatically uploading the sensors calibration data and configuring the transmitter's menus and display screens to the parameter. Versatile Model S80 Sensors are the intelligent sensor choice for a wide variety of applications, available in the following parameters: pH, ORP, Speciﬁc Ion, Dissolved Oxygen, Conductivity & Resistivity. S80 Sensors feature two universal sensor designs, Insertion/Submersion or Valve Retractable with flared end to prevent blow out. The standard Model S80 sensors have a rugged ¾-inch O.D. 316 stainless steel body with a 10-foot cable or an optional waterproof detachable cable assembly. The ECD six-point advantage makes S80 Sensors adaptable to most industrial applications. The intelligent sensors store calibration data, have a common configuration for all measurements, are economic with easily replaceable application specific electrode cartridges, in submersible and retractable designs with application specific materials of construction bring cutting edge versatility to ECD’s customers.